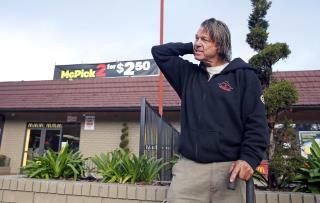 (Newser) – A homeless San Francisco man who calls himself a "news junkie" might be able to get off the streets because of his news habit: He will receive the lion's share of a $150,000 reward for helping recapture two escaped inmates in January, the Los Angeles Times reports. Matthew Hay-Chapman recognized the inmates' stolen van in a Whole Foods parking lot on Jan. 28 and spotted fugitive Hossein Nayeri emerging from the vehicle. He says he found a police officer and led him to the van, leading to the capture of Nayeri and fellow escapee Jonathan Tieu. A third man had surrendered a day earlier. That's a lot of 2-fer meals at McDonalds. Unfortunately for him, its now 2/$5 but that 's still a lot of junk food. That money will not last him long in California. Sure, it's enough for him to get himself on his feet if he uses it wisely like getting a decent used vehicle, a lower-end apartment and a job. He would be better off moving to another state to rebuild his life. Frisco has an extremely high cost of living. As does most other cities in CA. Most homeless people his age do not get a financial blessing like that. I hope the man uses it as a spring board to rebuild his life and does it wisely with determination.